Last month, the ashes of Liu Binyan (刘宾雁), the fearless investigative journalist and literary giant once dubbed “China’s conscience,” were quietly transported to China, where they were laid to rest in Tianshan Cemetery on the outskirts of Beijing, five years after the writer’s death in exile in the United States. Liu Binyan, who is remembered for his hard-hitting exposes of government corruption in the official People’s Daily newspaper, is still seen by many journalists and intellectuals in China as an enduring symbol of untiring conscience and opposition to abuse of power. 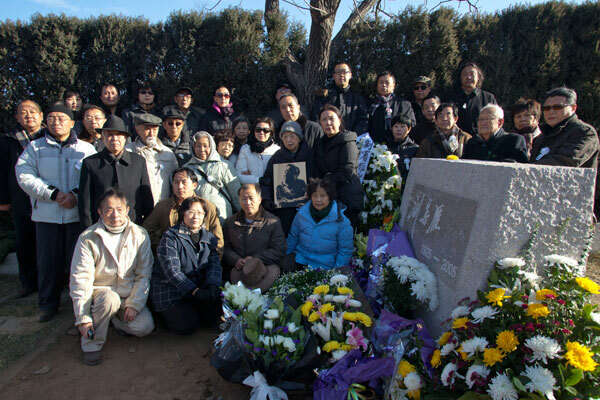 In a visible reminder of the legacy Liu left behind, a number of present-day press crusaders, including CMP fellows Hu Shuli (胡舒立) and Lu Yuegang (卢跃刚), can be glimpsed among those who attended the funeral ceremony on December 22. 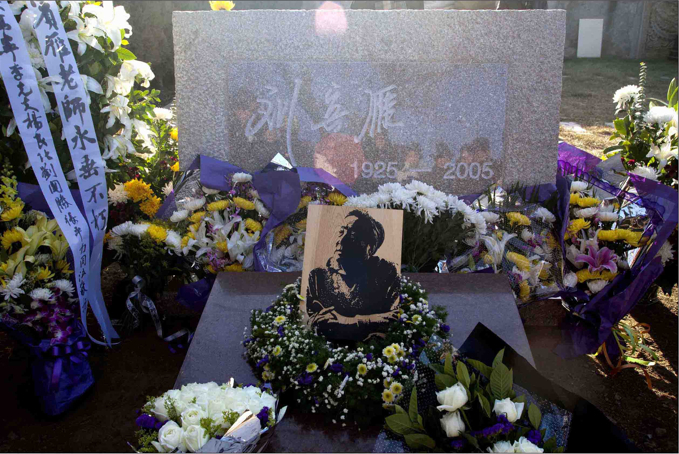 In a further reminder of just how sensitive Liu Binyan, his words and his work remain in China, there has been no mainstream press coverage inside China of the return of Liu’s ashes or the funeral ceremony in Beijing. A search for “Liu Binyan” in a database of more than two-hundred mainland newspapers over the past three years (to today) returns only 21 articles mentioning Liu Binyan. All are passing references to the writer, most mentioning him in conjunction with other writers of reportage. For more on Liu Binyan, his personality and his career, we recommend reading Perry Link on the subject, beginning with this piece for TIME magazine in 2003 and this obituary written for The New York Review of Books. Below is our translation of the remarks made by Liu Binyan’s son, Liu Dahong (刘大洪), during the December 22 ceremony. I thank you all for coming out on such a cold day to be a part of my father’s funeral, sending my father off on this the last stage of his journey. My father was born in 1925, and he passed away through illness in the United States in 2005. Today, five years later, my father has finally returned for burial in the soil of his homeland. My father returns to this land of his, but the social justice for which he struggled throughout his life has yet to be manifested in this land. More than 30 years ago, my father sounded an alarm to the whole nation about the dangers of corruption. More than ten years ago, far away across the ocean [in America], he issued many warnings from exile about the dangers of China taking the path of Latin America. All that he warned us against has come true, and is demonstrated again and again in the facts and fabric of life in our country. My father said before he passed away that he hoped the following words could be engraved on his tombstone: “The Chinese man who rests here did what he should have done and said what he should have said.” But the memorial stone standing before us today bears no words at all. And this stone without words makes a measure here and now of the distance that still separates us from a modern civilized society. I am confident that those who come after will some day be able to read these words of my father’s, and that they will hear the stories that lie behind this stone. Today is the winter solstice. The winter solstice is a day when the Chinese bury their dead, tend to their graves, offer sacrifices to their ancestors, and remember those who came before. Let us remember him. Let us remember the way he spurned the banquets of the rich and powerful and chose to stand on the side of conscience and the people. Let us remember the rough path that his life took, and how he fought unremittingly against the darkness, raising his voice for those who were oppressed and disgraced. Today is the winter solstice. The winter solstice is the longest day of winter. Let us remember him, and let his convictions add to the warmth of our own.